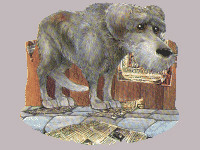 Gaspode the Wonder Dog (pronounced 'Gas-pode') was named after the famous Gaspode. After encountering first Holy Wood then the magic around the Unseen University, Gaspode has developed the ability to think and talk. Which is ridiculous as everyone knows dogs can't talk.